The California Cabernet Society is an alliance of wineries committed to expanding worldwide regard and appreciation for California Cabernet Sauvignon. 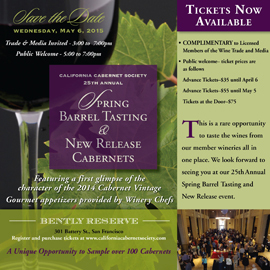 The California Cabernet Society was founded in 1991 by 40 small wineries for the purpose of promoting Cabernet Sauvignon and educating consumer, trade, and press about the qualities of California Cabernet Sauvignon. Each Spring the Society holds a major Barrel tasting in Northern California, showcasing barrel samples from the most recent vintage. Members of the trade and press are invited to taste and evaluate the promise and excitement of the newest harvest and its potential to develop into outstanding finished wines. To our knowledge, the California Cabernet Society tasting is the first organized and extensive tasting of the previous Cabernet Sauvignon vintage available to the trade and press. 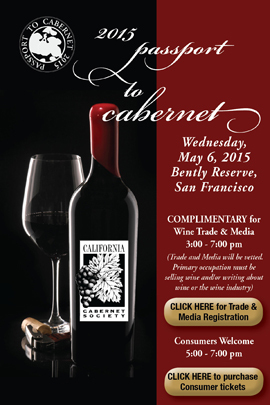 Copyright © 2006– California Cabernet Society All Rights Reserved.